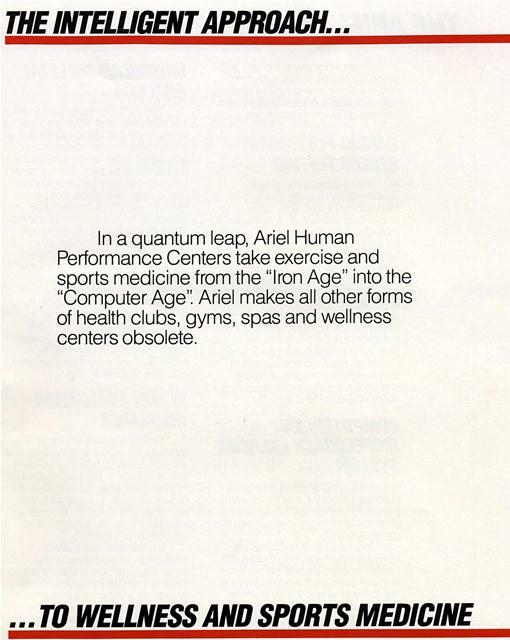 In a quantum leap, Ariel Human Performacne Centers take exercise and sports medicine from the "Iron Age" into the "Computer Age". An exciting new concept which combines science, technology, medicine and business and revolutionizes the approach towards wellness and sports medicine. Ariel Electrocardiography Systems bring you the latest in technology for fast, safe monitoring of exercise stress test. A fully automated system that is able to perform ST segment measurements in all twelve ways with the computer simultaneously monitoring, storing and printing the final report. Coupled with a breath by breath gas exchange analysis, it quickly and non-evasively provides an accurate measurement of VO-2 max and pinpoints anaerobic threshold to give you a precise indication of the patients exercise limitations. High speed computerization and metabolic imaging software streamline the interpretation of cardio-vascular function. A full array of electronic computerized exercise machines, each providing biofeedback, makes all other forms of health clubs, spas or gyms obsolete. 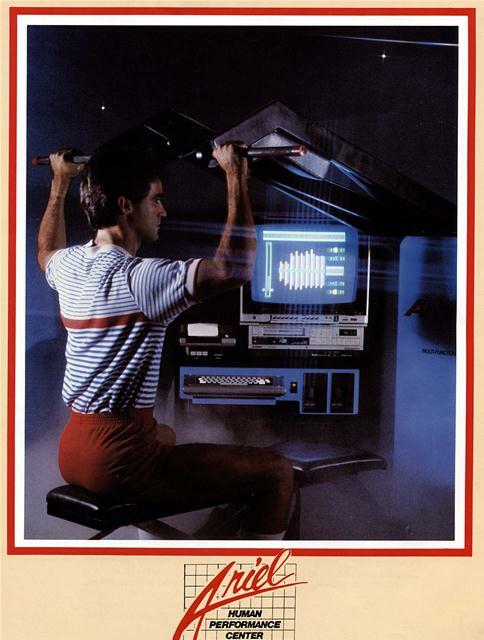 This futuristic exercise system provides each user with a personal computer diskette to store, record and compare each workout while at the same time accurately monitoring the user's performance in the prescribed exercise program. This new hi-tech approach to fitness will certainly establish the Ariel Human Performance Center as the place to be for "the smart workout:' and will generate the greatest revenue flow of all the Ariel components. The Ariel Computerized Exercise Machine, the most advanced form of exercise equipment available in the world today, now enables you to accurately establish fitness, strength and flexibility profiles. The computer instantly displays and records the user's reps, resistance, speed, velocity, work load, percentage fatigue, time, calories, force curves, strength at any point in the range of motion, past and present performance comparisons and then produces all this data, and much more, on the colorful computer screen, or in colorful printout form. Now for the first time with this "intelligent" machine you can remove the guesswork and scientifically evaluate human muscular/skeletal capabilities and, based upon scientific data, prescribe intelligent exercise programs. Finally, a scientific way to evaluate the extent and legitimacy of a muscular/skeletal injury. 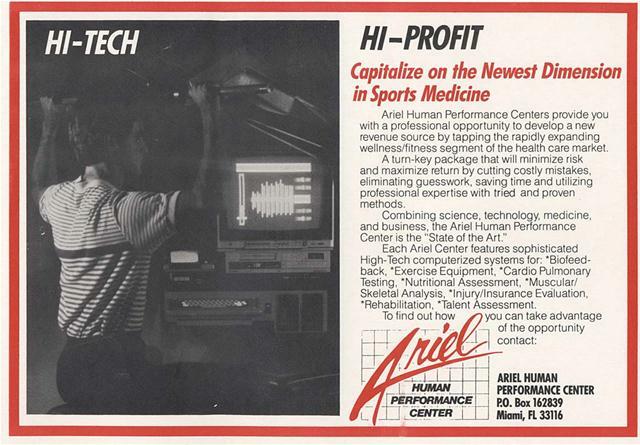 Utilizing Ariel's state-of-the-art computerized biomechanical analysis system it is now possible to make objective and scientific determinations of an individual's ability, disability, and rehabilitation progress. This system of disability evaluation, unavailable on any other equipment, will enable the Ariel Human Performance Center to provide a valuable service to insurance companies, workers compensation carriers, health maintenance organizations, and corporations in your community. For the first time there can be objective scientific quantification of disability. Complete cardio and orthopedic rehabilitation is another dimension of the Ariel Human Performance Center. The computerized exerciser not only monitors progress, it can help in pinpointing how far the user remains from normalcy and how long before he or she can resume full use of the weakened area of the body. The Ariel 4000 can, for example, build up a post-surgical knee by presenting it with the most appropriate amount of pressure each day. Coupled with laser treatment, hydro-therapy and state-of-the-art equipment, the Ariel Human Performance Center will be able to quickly and safely increase recovery time of ortho and cardio patients. Capitalize on the weight conscience nature of today's society and become the community leader in weight loss and control. The Ariel Nutritional Assessment Program utilizes the state-of-the-art computerized equipment to analyze the patient and generate scientifically designed diet and menu plans. In addition, the program monitors progress while motivating the patient by using an automated gas chromatograph. Computerized ultra-sound body composition analyses quickly and painlessly, and scientifically displays valuable information on the easy-toread color monitor while producing an informative printout. The scientific and intelligent approach to the problems of weight control will provide your community with an intelligent alternative to gimmicks and fad diets. If you want to show someone how to throw farther, jump higher or increase their distance off the golf tee, the Ariel Talent Assessment System can do it for you. By utilizing high speed camera's to photograph the action, digitizing the moving parts of the body, and feeding the data into the computer, will in turn produce the computer graphics and reams of athletic advice that no human authority could provide. 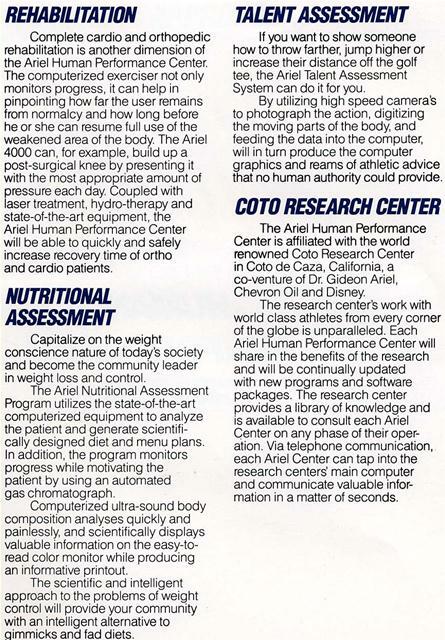 The Ariel Human Performance Center is affiliated with the world renowned Coto Research Center in Coto de Caza, California, a co-venture of Dr. Gideon Ariel, Chevron Oil and Disney. The research center's work with world class athletes from every corner of the globe is unparalleled. Each Ariel Human Performance Center will share in the benefits of the research and will be continually updated with new programs and software packages. The research center provides a library of knowledge and is available to consult each Ariel Center on any phase of their operation. Via telephone communication, each Ariel Center can tap into the research centers main computer and communicate valuable information in a matter of seconds. 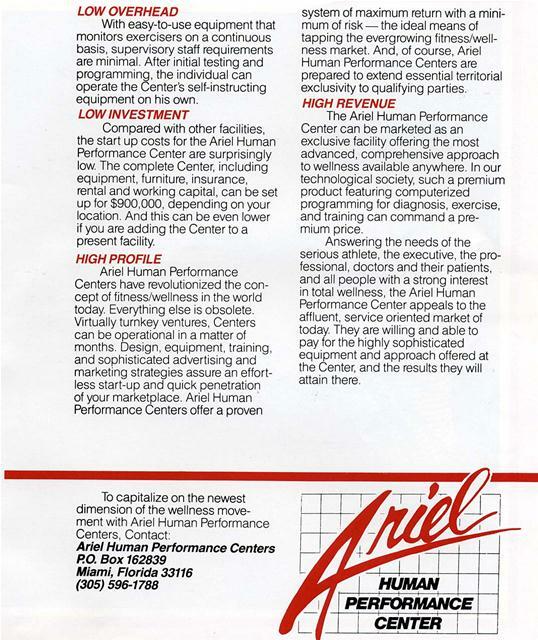 Ariel Human Performance Centers provide you with a professional opportunity to capitalize on this lucrative and rapidly expanding segment of the health care market. The Ariel Human Performance Center is not only the most comprehensive facility of its kind available, it is a high return investment in the future of fitness. Whether added to existing facilities or set up as a new operation, the Center lets you get in on the ground floor of the most advanced idea in health today - computerized wellness programming. be easily established as part of present facilities. It fits in perfectly with medical, rehabilitative, and modern sports facilities. And, the low space requirements make it ideal for use in industries and institutions. With easy-to-use equipment that monitors exercisers on a continuous basis, supervisory staff requirements are minimal. After initial testing and programming, the individual can operate the Center's self-instructing equipment on his own. 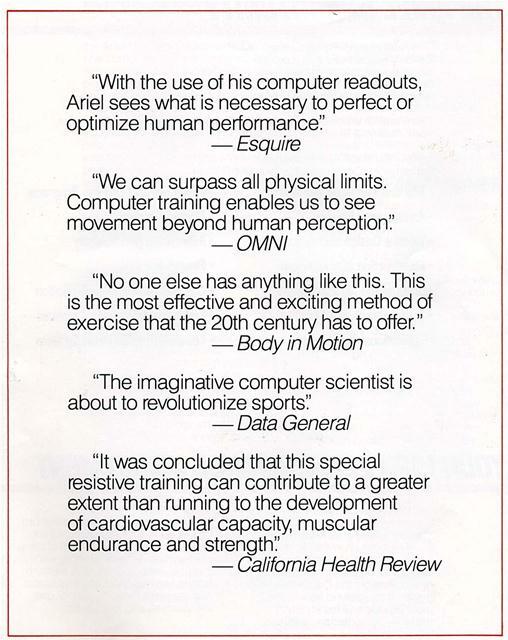 Compared with other facilities, the start up costs for the Ariel Human Performance Center are surprisingly low. The complete Center, including equipment, furniture, insurance, rental and working capital, can be set up for $900,000, depending on your location. And this can be even lower if you are adding the Center to a present facility. system of maximum return with a minimum of risk - the ideal means of tapping the evergrowing fitness/wellness market. And, of course, Ariel Human Performance Centers are prepared to extend essential territorial exclusivity to qualifying parties. 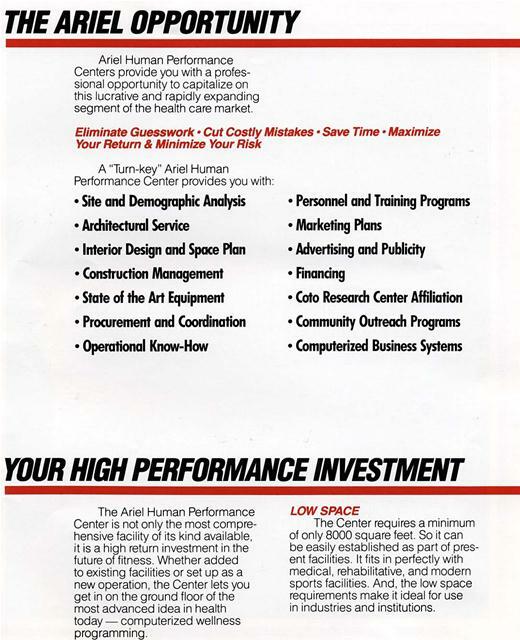 The Ariel Human Performance Center can be marketed as an exclusive facility offering the most advanced, comprehensive approach to wellness available anywhere. 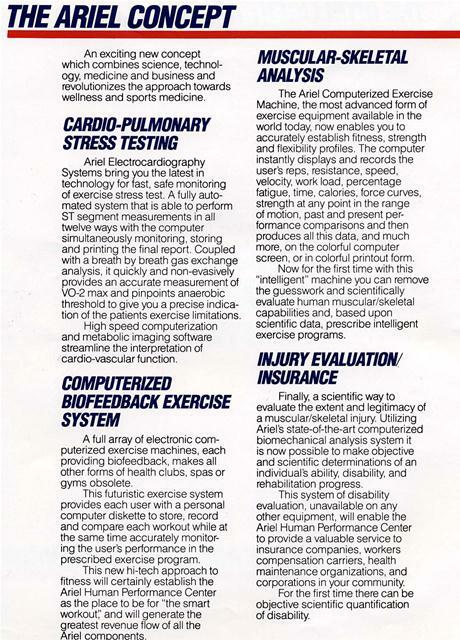 In our technological society, such a premium product featuring computerized programming for diagnosis, exercise, and training can command a premium price. Answering the needs of the serious athlete, the executive, the professional, doctors and their patients, and all people with a strong interest in total wellness, the Ariel Human Performance Center appeals to the affluent, service oriented market of today. They are willing and able to pay for the highly sophisticated equipment and approach offered at the Center, and the results they will attain there. Ariel Human Performance Centers provide you with a professional opportunity to develop a new revenue source by tapping the rapidly expanding wellness/fitness segment of the health care market. A turn-key package that will minimize risk and maximize return by cutting costly mistakes, eliminating guesswork, saving time and utilizing professional expertise with tried and proven methods. Combining science, technology, medicine, and business, the Ariel Human Performance Center is the "State of the Art." 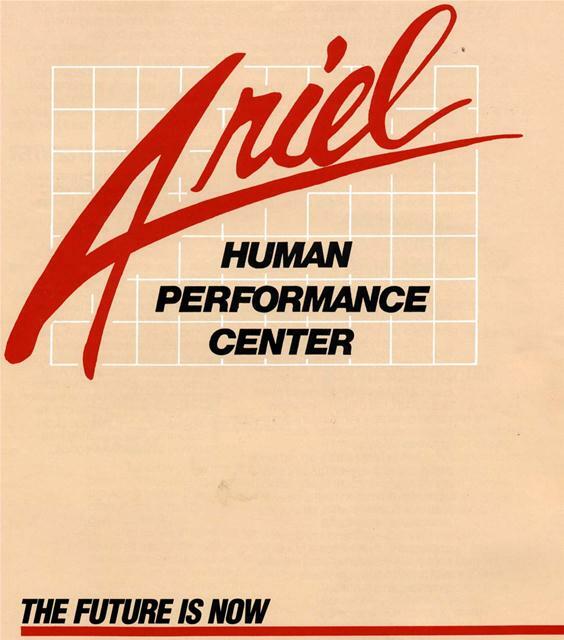 Each Ariel Center features sophisticated High-Tech computerized systems for: *Biofeedback, "Exercise Equipment, 'Cardio Pulmonary Testing, `Nutritional Assessment, *Muscular/ Skeletal Analysis, 'Injury/Insurance Evaluation, *Rehabilitation, "Talent Assessment. "We can surpass all physical limits. exercise that the 20th century has to offer." Generated on 4/24/2019 9:35:24 AM (PST) ADI/HQ/GBA/2019/ARIELCLOUD/v3.0.2018.0126.